You can view the version above in a pdf pop-up or view full html below. Sheila Bapat, author of Part of the Family? Nannies, Housekeepers, Caregivers and the Battle for Domestic Workers’ Rights offers remarks on domestic workers' rights. Learn about the challenges and successes of South Asian worker organizing efforts in the United States. Claiming Our Voice Panel Discussion and film screening with Gulnahar Alam (lead organizer and founder of Andolan: Organizing South Asian Workers), Jennifer Pritheeva Samuel (filmmaker & director of Claiming our Voice), YaliniDream (performance artist featured in the film) and Sheila Bapat (author of Part of the Family? Nannies, Housekeepers, Caregivers and the Struggle for Domestic Workers' Rights) offer remarks on domestic workers' rights. Learn about the challenges and successes of South Asian worker organizing efforts in the United States. The discussion is moderated by Preeti Mangala Shekar. This event was co-sponsored by Reimagine Race, Poverty and the Environment and ASATA (Alliance of South Asians Taking Action) and held at Oakstop Coworking in the heart of downtown Oakland. Tina Shauf is a community organizer and youth worker. She was born in the Philippines and raised in Los Angeles county. She is currently the Chair of Babae (meaning “woman” in Tagalog), a grassroots volunteer-based organization of Filipina women in San Francisco dedicated to supporting and empowering Pinays through critical education, leadership development, and community building. Shauf is also an active member and representative of the General Assembly Binding Women for Reforms, Integrity, Education, Leadership and Action (GABRIELA-USA), a grassroots-based alliance of more than 200 organizations, institutions, and programs of women all over the Philippines seeking to wage a struggle for the liberation of all oppressed Filipino women and Filipino people in general. 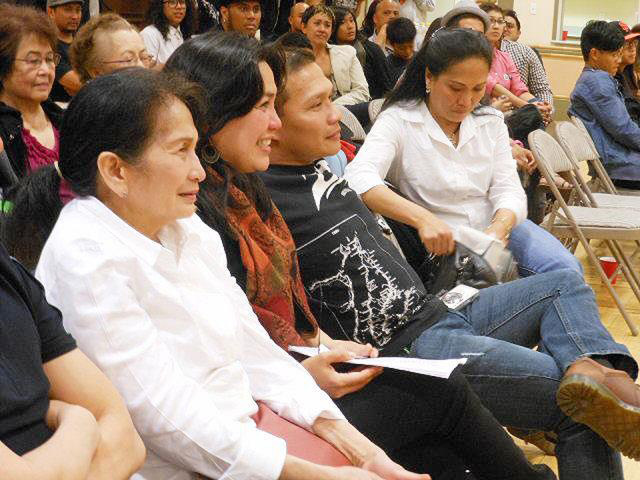 GABRIELA-USA is the first overseas chapter of the Philippine-based organization, extending the Filipino women’s mass movement to the United States. 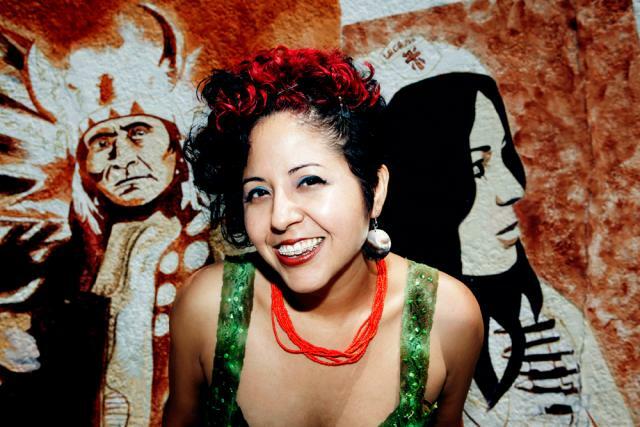 Christine Joy Ferrer: What issues are Babae and GABRIELA-USA currently prioritizing? And how do they impact low-income and communities of color where you live—especially Filipina women? Tina Shauf: We’re taking on issues in the Filipino community, for women particularly, through the Voices of Women versus Violence Against Women (iVOW) campaign. Under the GABRIELA framework, Violence Against Women is defined as seven different things, including economic exploitation, political repression, sexual abuse, and domestic violence. So it’s multifaceted. 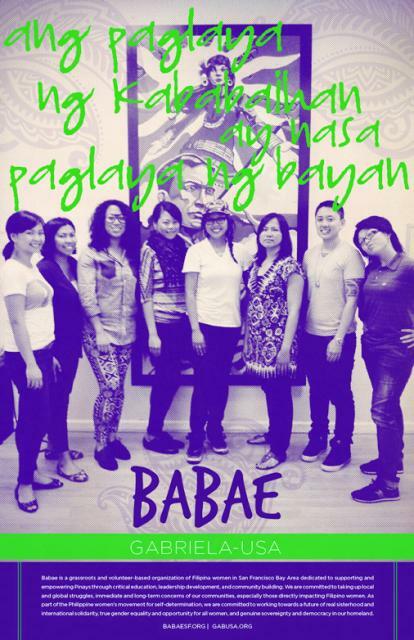 Also, Babae is co-sponsoring the Care Project at the Filipino Community Center in San Francisco where a group of caregivers comes together to understand better the conditions under which caregivers work. All of them are immigrants; they’ve left the Philippines because they had to support their families. Four thousand people a day leave the Philippines— 70 percent are women. A lot of the jobs they take on are domestic work, caregiving. In a room full of Filipinos, if you ask, “How many of you know a caregiver or are related to a caregiver?” most would probably raise their hand. So we see a need to take this on.